Middle Popo Agie River "Sinks"
A scenic canyon where the Middle Popo Agie River disappears into a cliff and then reappears a quarter mile downstream in a natural pool filled with large trout that you can feed. Optional 3.4 mile roundtrip hike to Popo Agie waterfalls. The sink, rise and waterfall all feel like Wyoming at its best and we highly recommend it. The first evidence of people in Sinks Canyon is dated to 9,000 years ago. For thousands of years animals and native Americans used the valley of the Middle Popo Agie river as a travel corridor to the Wind River Range. The valley was an annual migration route for game animals crossing the mountains due to the low grade. The Indians marked their passage with rock art on the canyon walls. The area provided stone for tool making and numerous berries in the Fall. Southwest aerial view of Sinks Canyon. The amount of winter sunlight and snow accumulation is responsible for the variation in canyon slope habitat. Colonel Frederick W. Lander led an expedition in 1859 to complete a wagon road between South Pass, WY and Fort Hall, ID. The expedition established the Lander Cutoff to avoid the Utah War between the Mormons and the U.S. government. Perhaps more important than the road was the work of the three artists who accompanied the expedition recording images of the exploration. Albert Bierstadt, Francis Seth Frost, and Henry Hitchings helped create a romanticized view of the American West with their art. One historian noted: “Bierstadt painted the West as Americans hoped it would be, which made his paintings vastly popular and reinforced the perception of the West as either Europe or sublime Eden” (Hyde, A.F, 1993). 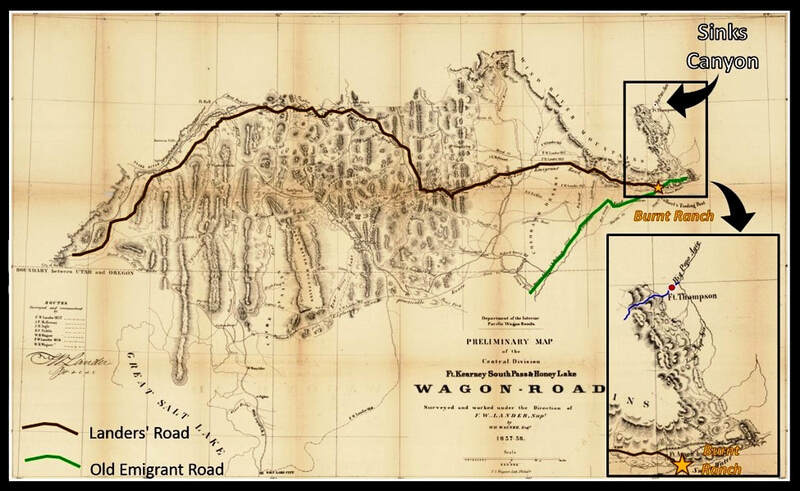 1858 Lander Expedition Wagon Road Map. Blow up shows location of Ft. Thompson (two miles northeast of present-day Lander at the confluence of the North and Middle Forks of the river). Middle Popo Agie River shown by blue line. Prior to the 1930s, Sinks Canyon was known as the Big Popo Agie Canyon. Sinks Canyon Native American rock art on Tensleep sandstone outcrop. 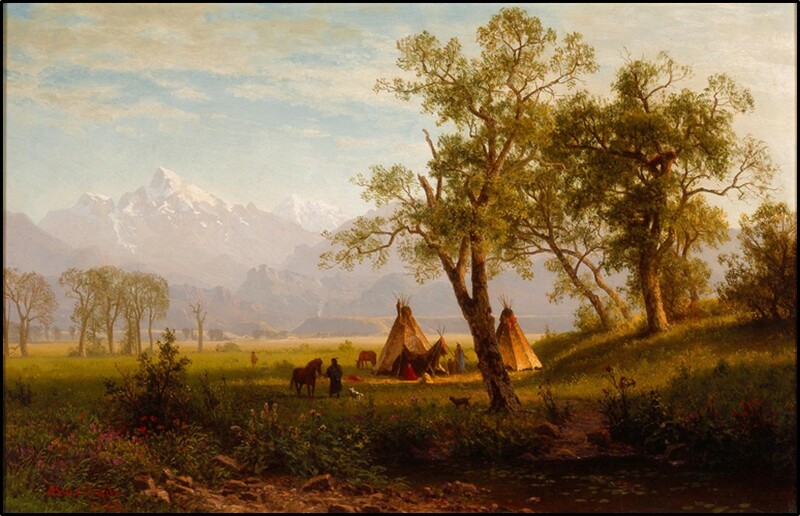 Albert Bierstadt painting, Wind River Mountains, Nebraska Territory, 1862. The glowing landscape, the small Indian camp and towering mountains on the distant horizons depict a romanticized view of the west. Sinks Canyon presents a landscape cut by a river and shaped by glaciers on the back limb of the Cretaceous to Eocene-age Wind River Range. The asymmetric arch is elevated by a southwest to south directed thrust fault system having 8.5 miles of vertical offset and over 16 miles of horizontal basement separation. The pre-Laramide strata were faulted, fractured and folded around the basement mass. Streams began eroding the highland creating numerous canyons over time. The Precambrian crystalline basement core was exposed, as was the flanking Paleozoic rock. 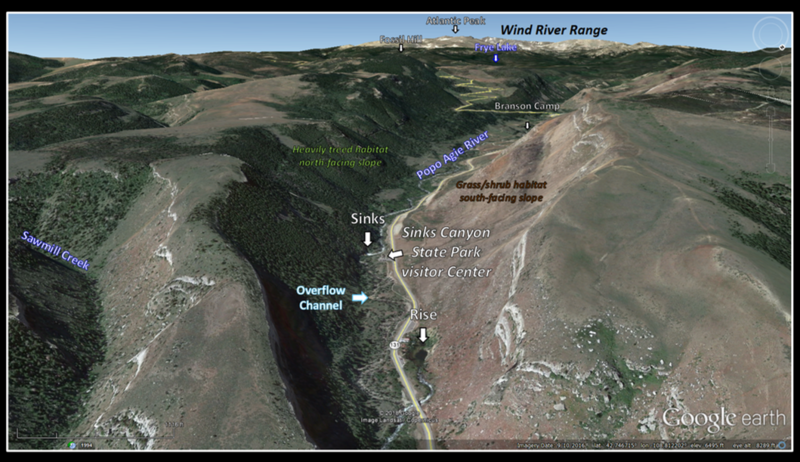 The backlimb slope dips to the northeast at 10-15 degrees into the Wind River basin. Structural geology cross section across the Wind River Range. Index map shows location of cross section. Image: After Blackstone, D.L., Jr., 1993, The Wind River Range, Wyoming: An Overview: Jubilee Anniversary Field Conference Guidebook: Wyoming Geology, Past, Present, and Future, Fig. 12, p. 130. Middle Popo Agie Stream Profile from Popo Agie Falls to the canyon mouth. Paleozoic outcrops in Sinks Canyon and stratigraphic column. ​Right: Sinks Canyon State Park website at http://www.sinkscanyonstatepark.org/nature/geology/sedimentary.html, Park City Outcrop: Google Earth Street View. Paleozoic rocks exposed in Sinks Canyon, youngest at the top right and oldest at bottom right. There are several caves and karst features in the area found in the Madison Formation. The Madison was deposited when Wyoming was covered by a shallow, warm sea during the Mississippian age (325-345 million years ago. Sea level fell, exposing the Madison for a period of about 25 million years. This long period exposure of the carbonate rock allowed paleokarst to develop on the upper Madison. The basal unit of the upper Madison is a regional solution collapse zone. During the Pleistocene the Wind River mountains underwent cyclic glacial and interglacial episodes. Massive volumes of ice move down the stream valleys bulldozing them into U-shaped canyons. Further evidence of their passing is preserved in the cirques and lakes in the high mountains, and the moraines and glacial erratics on the valley floor. The canyon may contain the most complete record of Pleistocene glaciation in the entire Wind River Range (Dahms, 2004). The remains of at least six ice advances are mapped in the Sinks Canyon glacial deposits (see map): 1) 5-fold complex of Pinedale (22-16 Ka), 2) Early Wisconsin (70-60 Ka), 3) Bull Lake (200-95 Ka), 4) Sacajawea Ridge (770-660 Ka), 5) young pre-Sacajawea Ridge (>770 Ka), 6) older pre-Sacajawea Ridge (>770 Ka). The Madison at Sinks Cave was exhumed during Pleistocene glaciation. Paleokarst and fractures were exposed to glacial melt water containing high concentration of carbon dioxide (CO2) that reacts with water (H2O) to create carbonic acid (H2CO3). Dissolution of the Madison enlarged and extended the cave network. Several caves and sinks occur in the upper Madison Formation in the Sinks Canyon area. In 1990, Boulder Choke Cave was discovered in the overflow channel by the park superintendent. Park employees give guided tours with advanced notice. Pinedale ice cap maximum model for the Wind River Range. Location of Sinks Canyon shown. Image: After Birkel, S.D., Putnam, A.E., Denton, G.H., Koons, P.O., Fastook, J.L., Putnam, D.E., and Maasch, K.A., 2012, Arctic, Antarctic, and Alpine Research, Vol. 44, No. 3, Fig. 8, p. 273. Pleistocene glacial deposits in the Sinks Canyon area. Image: Dahms, D.E., 2004, Relative and Numeric Age Data for Pleistocene Glacial Deposits and Diamictons in and near Sinks Canyon, Wind River Range, Wyoming, U.S.A: Arctic, Antarctic, and Alpine Research, 36:1, Fig. 2, p. 61. Madison outcrop in the Middle Popo Agie area. Formation are younger in the direction of structural dip. Karst/cave locations are shown with a red dot. 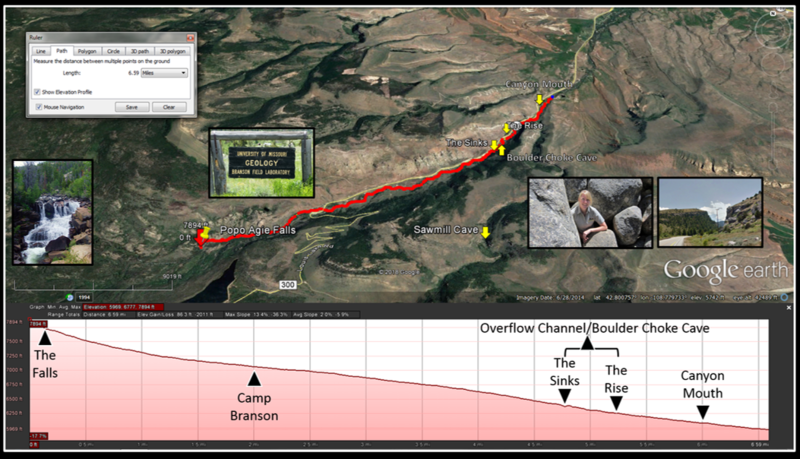 The rise (green dot) occurs in the Amsden outcrop that immediately overlies the Madison. The Popo Agie is a Crow word meaning “gurgling river.” Sinks Canyon is named for a feature called the Sinks, where the river flows into a cave and vanishes. It reappears a quarter mile downstream at the Rise. During Spring runoff stream flow can exceed the swallowing capacity of the cave. The excess water spills into an overflow channel on the south side of the highway. The connection between the sink and the rise was established from dye tracer tests. The underground river travel time is two to four hours between the sink and rise. More water resurfaces at the rise than disappears at the sink. Sawmill Creek, next drainage to the east, probably contributes to this flow by seepage into fractures connected to the same karst system. Left: The sinks where the river disappears underground into a Madison Formation cave. Right: The rise where the river reappears in a series of pools filled with trout. Left: The sinks at high water during Spring runoff. Right: The sinks during normal water flow. In 1911, Professor Branson from the University of Missouri began teaching a summer geology field course in the canyon. The area was selected for the diversity of geology and the excellent exposures across a vast span of the earth’s history. A permanent location (Camp Lander) was established in 1929. The site was renamed Branson Field Laboratory after its founder in 1949. For over a century, thousands of geoscientists have honed their skills at this field laboratory. The Canyon is a display case of geology that all can enjoy.